In anticipation for my final Arts Ink posting, my mom asked me what I was planning on writing about. I confessed that I hadn’t thought about it (and frankly had too many other things on my mind that took priority over this post). She went on to reflect on what a great opportunity it has been for me to have this job for my last two years of college. And she’s right and she’s wrong. Writing for Arts Seen and then Arts Ink has certainly given me the incredible chance to attend brilliant performances, readings, and concerts, and turn them into written reflections. Each Sunday this year, I’ve been able to sit down with my thoughts and soak my brain in all kinds of art curiosities, musings, and explorations. And hopefully, my writings have not only affected me for the positive, but also I hope it has inspired others to imagine, meditate, create, and engage with the beautiful world around them. For Jirō, that comes in the form of sushi. He dreams about it. He works from 5 am until after his restaurant closing time, living and breathing his sushi creations. And he’s 85 years old. I find tremendous admiration in the spirit of Jirō and his constant drive and passion to always improve his own craft as well as the experience for his staff and customers. You can tell that when he is in his restaurant, behind the sushi bar, with the starchy granules of rice and the slippery smoothness of fatty tuna belly on his fingers – he is in his happy place. That is where he wants to be. The 1940’s was a Golden Era for radio: from FDR’s fireside chats to Ralphie and Randy listening to Little Orphan Annie and the Lone Ranger in A Christmas Story. It was a new way of storytelling, a new way of communicating news. Instead of the communal fire of our ancestors, the radio became the centerpiece. Children were presented a story aurally and had to create mental motion pictures. Like an American Sign Language interpreter, your brain is always lagging one sentence behind of your ears; therefore proving that listening and comprehending stories rather than seeing them (in film) makes better brains. In the past one or two years, we have entered into a new Golden Era for radio. We’ve entered the Podcast Zone. Podcasts are pre-recorded audio files that can be downloaded at any time and in any order. They typically are released serially, like the old-fashioned radio shows used to be. Think of podcasts as Netflix for your ears, except that they require more imagination. Podcasts really are portable – the most “low-tech as high-tech gets,” says Lance Ulanoff of Mashable. All you need is your phone and earbuds. No wi-fi necessary. Completely hands-free. Just press play and enter a new world through your ears. A particularly fruitful app for podcast exploration is Podbay, which can be downloaded on both Apple and Android products. It’s easy for just about anyone with any particular interest to find a podcast that suits them. Health, books, psychology, politics, comedy, spirituality – you name the subject and I promise there will be a podcast out there for you. What am I listening to right now? (Except for Cabin Pressure, all available via Podbay). Serial – The groundbreaker series for podcasts. Loved the first season. Welcome to Night Vale – A twice-monthly radio show in the style of community updates for a small desert fictional town called Night Vale. Features include a weather report, news, announcements from the Sheriff’s Secret Police, mysterious lights in the night sky, dark hooded figures with unknowable powers, and cultural events. The Dead Authors Podcast – In support of 826LA, this podcast is hosted by H.G. Wells who has rigged his time-traveling machine to transport dead authors and poets to the 21st century and what follows is an hour long conversation about their lives, their writings, their loves, and their sometimes (mostly) strange idiosyncrasies. Invisibilia – For psychology nerds out there, this ones for you! Explore the “invisible things” of our world, like why we have thoughts, emotions, dreams, and beliefs. Cabin Pressure – Want to hear Benedict Cumberbatch before he was famous? This comedic BBC radio show (which is sadly no longer produced) takes place on a fictional airplane and drama ensues between the oddball crew. Tune in next time for my last Arts Ink blog ever! Ever since I was a wee little girl, my dad and I had woken up bright and early on Sunday mornings (though sometimes pushing the limit with only one minute to spare!) We would pad down the stairs, careful not to wake my still-slumbering mom. Armed with warm beverages and the coziest of blankets, we would snuggle up together as the show’s notorious sun yawned and stretched out his rays. There was Wynton Marsalis’ trumpeting fanfare, which we’d mimic by putting our fingers to our lips and wiggling them around, making sure to hit all of the invisible and silent octaves. “Good morning, Charles,” we would say to each other in Bob Schieffer’s famous grandfatherly voice. And then, suddenly, Charles Osgood himself was speaking directly to us, welcoming us to a wonderful new day. Even though we would have to mute yet another commercial for arthritis medicine and tio-tropium bromide inhalation powder, this Sunday morning tradition became the thing I looked forward to most each week. I hope my dad did, too. Now, of course, I am in college and come back home less and less frequently. But my dad makes sure to write down all of Steve Hartman’s heartwarming stories and Mo Rocca’s squirrel-eating shenanigans on tiny little sticky notes, so we can still bond and learn together over a breakfast at Angelo’s. During my sophomore year of college, I was taking an introduction to theatre course through the RC. One of my fellow students happened to be a woman from CBS who was spending a year at U of M for a journalism fellowship. I asked her if she knew Charles Osgood, Tracy Smith, and Anthony Mason, and she said “Yes!” She even had been at a dinner party at Osgood’s house, where he played the piano for her (the episodes where he plays the piano are very special occasions in the Finch household). I asked my classmate if she would become a messenger between myself and the CBS reporters who had secretly shared Sundays with me for the past ten years. I had a very important message to send. I had remembered that sometimes letters and poems by fans had been read on the show by Charles Osgood himself! What did I have to lose? The girl in my class eagerly did some magic behind the scenes and sent my poem to the friends at CBS. I wasn’t sure what would happen next. Perhaps, it would be seen, swallowed, and cast down to the bottom of the intern’s inbox. But no! One night as I worked late on a paper for class, an email dinged. <From: Steve Hartman> it said. Steve Hartman – the man who each week reports on a story of real everyday heroes who battle diseases, help strangers for nothing in return (let’s face it, basically stories that end with you running to the bathroom to grab a tissue to stop the tears forming in your eyes) – had written an email to me, from his own personal email address. The email basically acknowledged that he had seen my poem and wanted to let me know how sweet it was. How it touched him to know that what he and his colleagues did at the Sunday Morning show was meaningful to my dad and me. Although my poem was never read aloud on live air, I can’t help but feel like it’s almost better that it wasn’t. The people who needed to know now know and we can keep that knowledge between ourselves. They know they have a fan who appreciates what they do. They know that the sun shall rise again and again, because someone will watch it. That’s what traditions are for: they are little private moments that don’t need to be vocalized to the whole world, just to the ones who are there to share it with you. It’s April 3! Which means that we’re exactly three days into National Poetry Month! I participated for the first time in 2015 and enjoyed it so much that I’ve been waiting all of March for the clock to turn 12:00am on April 1st. Anytime I think of a particularly good phrase or a poetic image, I scribble it in my notebook or on the Notes section of my phone for later use. People often ask me, “Isn’t it a burden- having to write a poem everyday on top of your homework and social life?” And I honestly thought it was going to be. But it wasn’t at all. In fact, the poem became the high point of the day. After collecting “data” all day, I could make sense of it – make art out of it – and produce something that I could share with my friends and family. (The community of National Poetry Month participants on social media is incredible). But before I get too far ahead of myself, you may be asking what National Poetry Month actually is? According to poets.org, this thirty day celebration was created by the Academy of American Poets in 1996. Inspired by Black History Month and Women’s History Month, National Poetry Month is intended to spark the appreciation, curiosity, reading, creating, and teaching of poetry for thirty whole days of April. People throw out the advice that you should “write every day.” And it’s true. Just like tennis or swimming or knitting, the more you practice, the better you become. But National Poetry Month is only 30 days, you say. What happens when the thirty days are over? I personally do not continue to write a poem a day after April 30. For me, it’s the undaunting focus of only thirty days that motivates me and results in the most productivity. Thirty days is just enough time where the excitement is still high. Exhaustion hasn’t set in yet. I leave wanting more. And what do you have at the end of those 30 days? Well, you’ll have some really good poems. You’ll have ones you scratch your head and think proudly, “Did I do that? That should be in a book!” You will have ones you can’t believe you let out of your head and shame them back into oblivion. But most of all, the poems are mini time capsules of the life lived during those thirty days. Almost like a flashbulb memory, you’ll remember the specific details of that day that tipped your consciousness into writing it. It could be an overheard conversation, a magazine advertisement, a question that crossed your mind, what you had for lunch, an event you attended. Everything and anything is fodder for a poem. One of my good friends pairs her poems with a photograph taken on that day. What better way of annotating a month-long photo album? Ultimately, poetry is a celebration of the little things – the flowers, the footprints, the ladybug, the crumbs on your face – as well as discussion starters about bigger things like inequality, abuse, death and love. Poetry is a way of expressing your viewpoint or confronting topics you don’t quite understand. It’s a way of crafting sonically beautiful thoughts, or sometimes, it’s just a way of preserving a moment you want to capture forever. Poetry can be as simple or complicated as you want it to be. It’s flexible and raw, in form and spirit. Poetry is for everyone. Not interested in the writing aspect of National Poetry Month? No worries! There are tons of ways you can still be involved! -You can also sign up for Poem-a-Day to receive free daily poems by email all year long. -Start a poetry reading group. -Review the many forms of poetry. Go on … sound your barbaric yawp …it’s National Poetry Month! You are standing still. Close your eyes. Imagine an ant crawling over the bones of your left foot. It finds a nest in the space between your toes. Then, more of them appear. They surround your feet, tracing their shape…and then, they start the ascent. Trailing up your legs, between them, up your belly. One tickles the thin skin on your wrist. You swat it away only to find two more have replaced. You are swarmed with them. This has become a full-on infestation. The ants with their furry feet and beady abdomens journey across the map of your face, your hilly nose, into the depths of your ears, until they disappear into your hair. Feeling a bit disturbed? This, says the dance instructor, is how you should always feel when you perform Butoh. This semester, I’m taking Asian 200 – Introduction to Japanese Civilization. It is just that – an overview of each major period of Japanese history from the Heian Era to the Meiji to World War 2 and today. As we near the end of the semester, we have just begun our discussion on the 20th century. Because an entire course could be dedicated to World War 2 and Japan’s role in it, we have focused more on the effects of the war on the people, the economy, and the arts. One of the most innovative arts to come out of the post-war era in Japan was the avant-garde dance called Butoh (which literally translates to “dance which steps on a political party” or any dance that is not sanctioned by the Japanese government). 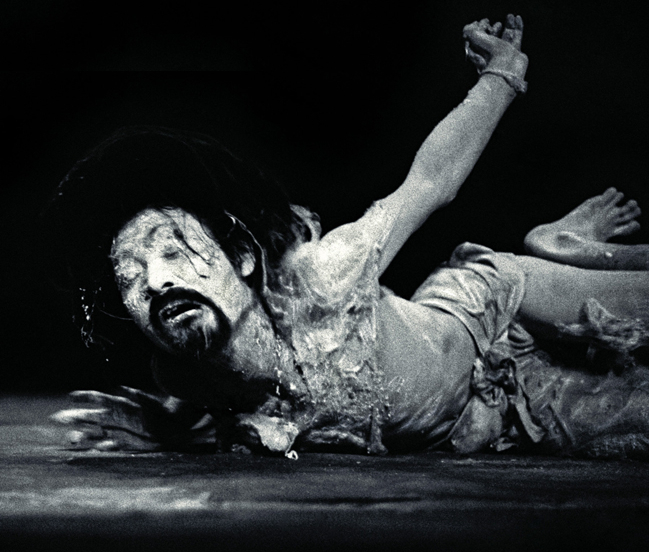 Created by Hijikata Tatsumi and Ohno Kazuo in 1959, butoh strove to become the new Japanese dance, which broke away from both Western modern dance and traditional Japanese dances. Especially after the bombings of Hiroshima and Nagasaki, there wasn’t a time when nationalism was more necessary to unite the country after tragedy. Butoh was the catalyst for young Japanese artists and intellectuals of the early 60’s to reject the status that Japan had been reduced to by Western superpowers. They wanted to subvert the sense of “alienation, dehumanization, and loss of self-identity” ( Klein, Susan Blakeley. Ankoku Butoh. Ithaca: Cornell East Asia Papers, 1988: p. 9) that had been assigned to them. Through the performance of Butoh, the dancers embrace a grotesque beauty – where they often make their expressions as revolting as possible, yet move across the stage with a paradoxical grace of controlled spasms. In a way, the more alienated and dehumanized the dancers become on stage, the richer the social critique. The emaciated (and often naked) bodies of the dancers are covered in a thick white powder, highlighting ribs muscles, and especially the facial features. The dancers are enrobed in a mist macabre and their movements further unsettle the audience. We watched a few videos in class and had to define our emotional response to them. Classmates answered “confused,” “creeped out,” “disturbed.” I think this comes from how weak the dancers appear (which of course is all an act). We feel awkward watching extreme suffering (even if it is fake) before us. The dancers become hyper-human in their ability to decompose and waste away. They become an alternative form of the humanity we thought we knew. But how do they do it? Understanding that such a foreign dance would be difficult to talk about without experiencing it firsthand, my professor brought in a Butoh artist/scholar named Dr. Katherine Mezur to teach my class real exercises that are used in professional Butoh troupe lessons. We were instructed to wear loose, moveable clothing and white, cotton socks (though it was ambiguous which was more important: the whiteness or the cotton-ness). We were given the option to sit out if we ever grew uncomfortable. While I promised myself that I wouldn’t let myself sit out, I was pretty sure that at least one person in our class of strangers would feel shy or embarrassed, and gratefully accept the role of observer. But no! Everyone participated. One of the first exercises after getting loosened up was the immersive imagination scene I referred to earlier: the one with the bugs. Because we had our eyes closed, we were all embarking on our own experience, yet we shared the energy of everyone in the room. We then learned a shuffling step, which provides the base for all Butoh movement. Moving around in the same space, we had to be aware of each other’s persons. We became each other’s obstacles. To complicate things even more Dr. Mezur would yell out an animal or a kind of material (glass, steel, wood) and we’d have to internalize these properties and incorporate them into our basic movement. This exercise was to teach us to realize the materiality of the body. 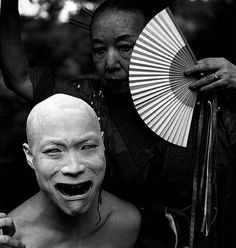 The most bizarre, and most striking, element of the Butoh dance is the facial expression. Dr. Mezur taught us to roll our eyes back (Exorcism-style), cover our teeth with our lips, open our mouth, and draw in your neck like a gobbling turkey. Luckily, everyone else’s eyes are turned up to the ceiling too, so no one could make fun of how ridiculous we looked. Happy first day of Spring! March 20 marks the Spring Equinox and if the warmth of the sun rays today showed us anything, it was that the calendar and the earth have finally connected via speed dial and coordinated their outfits. 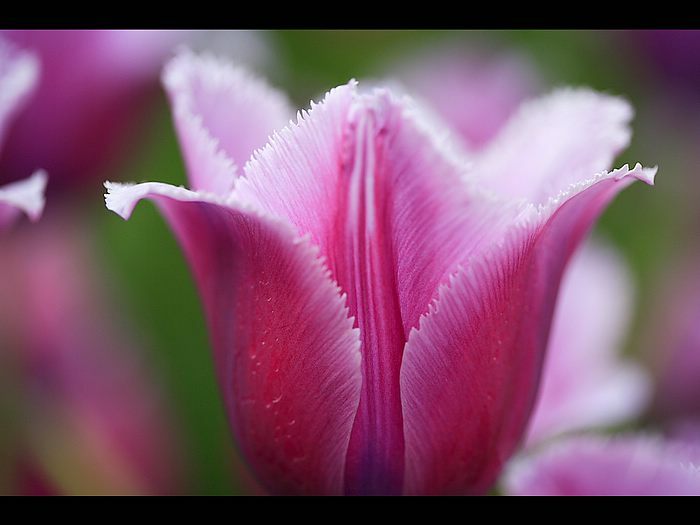 Spring is, of course, a time associated with fresh starts, rebirth, blossoms, and joy. But this so often is spring “in theory,” “in the ideal greeting card world,” “in warm-weather latitudes.” When the rains come, all too often with exams and papers in accompaniment, it is easy to get a little down. In order to motivate myself (GRADUATION IS ALMOST HERE! ), I’ve made a list of tasks and skills I want to accomplish or at least take a stab at to remind me that spring has sprung and that there’s no better time to discover, learn, and live. Sneak into an East Quad music practice room and learn how to play this on the piano. Write a few of my favorite quotes on paper with a purple calligraphy pen, and have them framed. Attend a Swing Ann Arbor event. Start sending more snail-mail letters to friends. Ummm…find a job for next year!!! Enjoy every day as it comes and make the most of it.